DEARBORN, Mich., Feb. 05, 2016 – Ford Motor Company is awarding Jennifer Scott, the winner of the 2015 “Drift with Ford” Sweepstakes, a fully tuned and custom Ford Focus ST, driving lessons with drifting champion Vaughn Gittin Jr. and other perks in collaboration with the Formula DRIFT race series. In addition to owning a one-of-a-kind Focus ST, Scott will receive a trip for two to Ford’s ST Octane Academy for one-on-one drifting lessons with Ford Mustang driver and Formula DRIFT champion Vaughn Gittin Jr. As an added bonus, Scott will visit Hoonigan Racing Division headquarters, garage of Ford driver and Gymkhana star Ken Block, and take a tour of the facility. 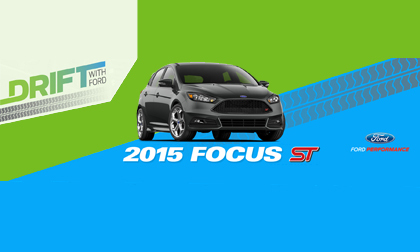 Ford kicked off the 2015 sweepstakes at the Formula DRIFT season opener in Long Beach, California. Throughout the 2015 season, Formula DRIFT fans had the option to enter online or in person at each event. Ford has supported Formula DRIFT drivers since 2005, when the series triggered a successful engine development program for a Ford Performance Racing Parts supercharged 4.6-liter V8 crate engine. Each year, Ford has increased its support and involvement in drifting, with 2015 marking the third year of the “Drift with Ford” program. Ford’s ST Octane Academy is based at Miller Motorsports Park – a state-of-the-art racing facility located about 35 minutes from Salt Lake City. ST Octane Academy is a complimentary experiential program made available exclusively to new Ford Fiesta ST and Focus ST owners. As the first official drifting series in North America, Formula DRIFT takes motorsports to the extreme, attracting enthusiasts from all walks of life. Highly skilled drivers maneuver high-powered cars into controlled slides at high speeds through a marked course. Judged on speed, execution and style, drifting is a crowd pleaser that’s often compared to the freestyle nature of skateboarding and motocross. For more information, visit the Formula DRIFT website or Facebook.